Seventh illustration for Oliver Twist in Kyd's sequence of twelve water-colour "extra illustrations." See below for passage illustrated and commentary. Scanned image and text by Philip V. Allingham. [You may use this image without prior permission for any scholarly or educational purpose as long as you (1) credit the person who scanned the image and (2) link your document to this URL in a web document or cite the Victorian Web in a print one.]. He was roused by a touch on the shoulder, and a request from the man with the keys to follow him into the office. He closed his book hastily; and was at once ushered into the imposing presence of the renowned Mr. Fang. The office was a front parlour, with a panelled wall. Mr. Fang sat behind a bar, at the upper end; and on one side the door was a sort of wooden pen in which poor little Oliver was already deposited; trembling very much at the awfulness of the scene. Mr. Fang was a lean, long-backed, stiff-necked, middle-sized man, with no great quantity of hair, and what he had, growing on the back and sides of his head. His face was stern, and much flushed. If he were really not in the habit of drinking rather more than was exactly good for him, he might have brought action against his countenance for libel, and have recovered heavy damages. The old gentleman bowed respectfully; and advancing to the magistrate's desk, said, suiting the action to the word, "That is my name and address, sir." He then withdrew a pace or two; and, with another polite and gentlemanly inclination of the head, waited to be questioned. Now, it so happened that Mr. Fang was at that moment perusing a leading article in a newspaper of the morning, adverting to some recent decision of his, and commending him, for the three hundred and fiftieth time, to the special and particular notice of the Secretary of State for the Home Department. He was out of temper; and he looked up with an angry scowl. Mr. Fang, the rabidly punitive police magistrate before whom Oliver appears on a charge of theft, is a vindictive functionary of the law based on one Mr. Laing, a justice at Hatton Garden whose harsh and unreasonable sentences eventually resulted in his removal from the bench. 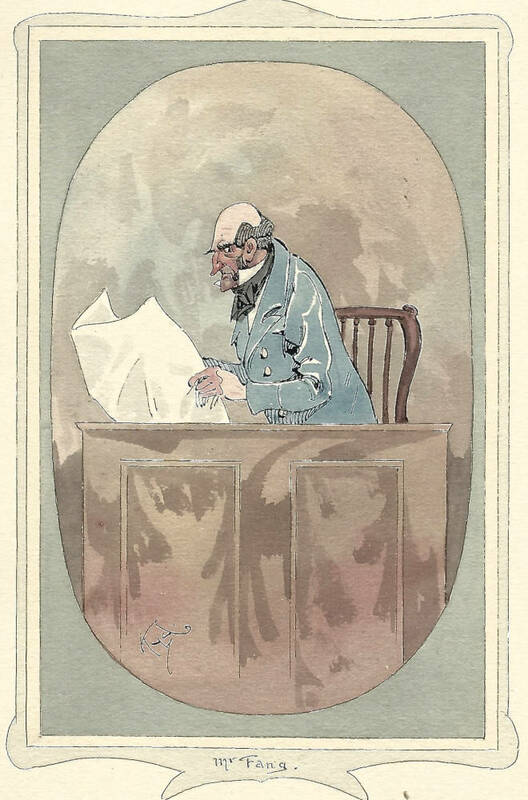 Fang was not a favorite subject for illustrators of Dickens, and this may be the only portrait of him. Pailthorpe, Frederic W. (illustrator). Charles Dickens's Oliver Twist. London: Robson and Kerslake, 1886.